How do you find new readers when you don’t even know where to start? How do you target the best reader groups to buy your books? 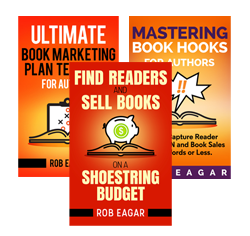 How do you create book sales from scratch – even with a limited budget? The answer to all of these questions is online advertising…more specifically, Amazon’s advertising for books. Why Amazon? Most people know that Amazon is the dominant player in the publishing industry and attracts the largest gathering of readers in the world. Recent statistics have revealed that over 40% of ALL book sales go through Amazon. Plus, they’ve got a whopping 70% marketshare of all e-book sales. So, if you want to get your books noticed where readers congregate en masse, Amazon is the place. More importantly, people who shop on Amazon are already in a mindset to purchase (that’s not the case with Facebook or any other social media platform). 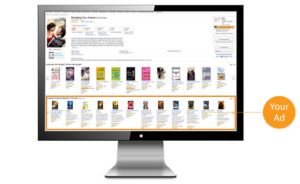 When someone is browsing books on Amazon, they’re in a situation where they can purchase with one simple click of a button. And, if they’re a Prime member, they get two-day shipping for free. 1. Amazon ads only charge on a pay-per-click basis. Pay-per-click means that if no one clicks on your ad, then you don’t pay. Therefore, you’re not penalized if people see your ad, gloss over it, or get distracted. They’ve got to actually click on the ad and go to your specific book page for your credit card to get charged. 2. Amazon ads give thousands of impressions for free. Since Amazon only charges on a pay-per-click basis, authors can get thousands of impressions for free. Even if people don’t click on your ad, they still see it on their screen. Your book title, book cover, author name appear in front of people, which helps build author discovery and brand awareness. Half of the battle is just showing up in the first place. 3. Amazon ads are easy to create. Compared to Facebook, Amazon ads are a breeze to set up and monitor. There’s only three simple steps. Choose what type of ad you want to buy. Choose the book cover you want to promote. Then, write a 30-word marketing hook to go with your ad. 4. Amazon ads cost as little as $1 – $5 per day. If you’re an author on a shoestring budget, Amazon lets buy advertising for $1 – $5 a day. That’s dirt cheap! And, you can set your own keywords to help target your ad to the shoppers most likely to buy your book. 5. Amazon won’t waste your budget. Unlike Facebook or Google, Amazon is hesitant to spend the money you give them. Other platforms will spend daily budget as fast as they can. However, I’ve heard from several authors that Amazon’s algorithms are quite conservative. So, they make your money go a longer way. Hopefully, that remains the case in the future. 6. Amazon ads are simple to test and adjust. Successful advertising requires constant split-testing and tweaks to determine what works best for your books. But, on Amazon, it’s easy to set up numerous ads and change various keywords and bid prices to figure out the most effective approach. My clients have found that it’s better to set up 50 – 100 inexpensive ads, rather than 10 higher-priced ads. Amazon’s simple system makes adding more ads a snap. 7. Most authors don’t know Amazon ads exist. Amazon’s advertising for books is a relatively new system. It really came on the scene in the latter half of 2016. Therefore, many authors aren’t aware that Amazon even offers an affordable and easy-to-use system. Wise authors can take advantage of it now and get a leg up on the competition before the market is saturated. Full Disclosure: At the time of this writing, Amazon ad placements are only available to publishing houses and self-published authors. In other words, you have to be the legal publisher of a book in order to gain access to ads. If you’re a traditionally-published author, your publishing house is considered the legal entity who Amazon views as the publisher of a book. In contrast, if you self-published a book through Amazon’s Kindle Direct Publishing or CreateSpace services, then you are seen as the legal publisher of your book. 1. Contact Amazon via your Author Central Account and request access to ads. When you log into your Amazon Author Central account, there’s a “help” button you can click and email Amazon directly. Send them a message to ask, “Please make Amazon ads available to traditionally-published authors. This will help create a groundswell of interest to help convince Amazon to make their ad system available to all authors. 2. Ask your publisher to buy Amazon ads for your books. Yes, this option can actually work. I’ve had two author clients confirm their request was accepted by their publishing house. Most publishers are aware of Amazon ads and already using the platform. So, it’s okay for you to contact your publisher by phone or email and ask, “Please put part of your marketing budget on Amazon ads for my book.” You’re only talking about $50 – $100 per month, so it’s a fair request. 3. Give your publisher money to buy Amazon ads for your books. Seriously, do it. Amazon ads are that beneficial. If your publisher won’t buy Amazon ads on your behalf, then take the initiative to say, “I will give you $50 – $100 for a month’s worth of ads to test their system on my book.” Be serious and explain how Amazon ads are a productive way to find new readers. Your publisher wants to sell more books, just like you do. 4. Self-publish a book with Amazon to buy ads for your author brand. I know this option might seem extreme, but I’m doing it myself with small e-books. Self-publishing on Amazon is completely free for anyone using their Kindle Direct or CreateSpace options (Go to: https://kdp.amazon.com/). When you self-publish with Amazon, you get access to their advertising system. No, you won’t be able buy ads for your traditionally-published books. But, you’ll get access to buy ads for self-published titles that help build awareness for your author brand. In addition, you can use self-published books on Amazon as tools to build your author email list and cross-promote your traditionally-published books…pretty sneaky, right? Amazon may not be considered a friend of the major publishers. However, their unique advertising system for books is friendly to authors. If you want to attract new readers at the world’s largest bookstore for less than $5 a day, take steps to set up Amazon ads.